tramadol veterinary formulary“$100 Million Wasted On Ads That Never Pay” was written by Claude Hopkins in 1909. Hopkins was possibly the highest salaried copywriter in history — he pulled down today’s equivalent of $4.5 million a year. There was a reason his boss, Albert Lasker, paid him so much. He brought in more revenue for his agency and their clients than any ad writer had ever done before. “We estimate that every year is wasted $100,000,000 on ads that should never run. That $125,000,000 is being spent annually to accomplish what $25,000,000 should do. In 2013 dollars, $100 million translates to $2.5 billion dollars. For all the waste circulation in advertising today, $2.5 billion seems improbably low. Keep in mind that print advertising was largely the only game in town back then. But what Hopkins railed against a hundred years ago is still as true as ever. Even today… most advertisers never test! As impossible as it is to fathom, it’s completely commonplace. It rides on the reputation of it’s founder, Ken Fisher, who’s been a long time columnist for Forbes magazine. Few have made as much hay out of being a columnist as Ken Fisher and his firm is reputed to spend $30 million a year on direct mail marketing. 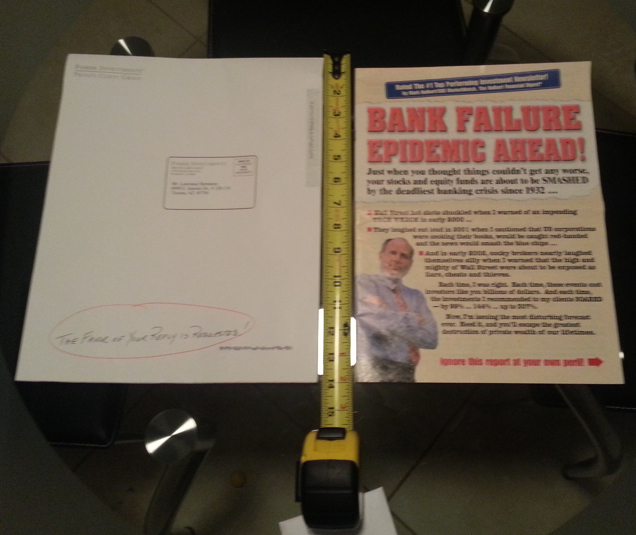 After receiving the same oversized direct mail piece from Fisher Investments — for perhaps the 50th time (really) — I was tempted to write a mini expose about them. That was over four years ago! Until now, I haven’t written one word about them, and in the interim, absolutely nothing has changed in their marketing. I’ve probably received over 100 of them by now in total. To their credit, they seem to have some competent creative for their online advertising. The preamble for every ad they run — “If you have $500,000 to invest, then download this free report — is mechanical, yet effective. 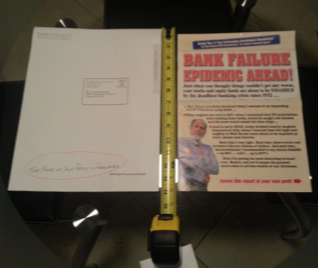 But as far as direct mail goes… testing is non-existent. He’s succeeding in spite of himself. Then I asked him to take a look at this. This is a letter which mailed in 2004 and it’s little different from the version mailing today. Establishing the credibility of the sender is necessary but 14 first-person references is beyond the pale for even a direct mail neophyte. So, I had to laugh when I read this quote from Fisher. Yes, that’s true, but he’s ignorant of the basic direct mail fact. Gary Halbert was on the money about this. Sure, the first time a prospect gets Fisher’s “big white envelope,” which is larger than even a tabloid sized magalog, it gets his attention. But the third, fourth… and twenty-second time a recipient get it… it goes in the trash. Because the reader already knows what’s inside. He doesn’t need to open it. Now, the prospect can’t say, “I’ve seen this before” and toss it. But where Fisher really falls on its face is the lack of ascension. How much easier would it be selling a newsletter on the front end and get a crack at establishing some credibility and rapport with paying customers… and only then persuading them to invest? Prying even as little as a dollar from a prospect sets incredible things in motion. Fisher will probably never find out. Just a quick—-was the circle surrounding envelope tease yours or theirs? I’ve been on the Wanted list before..
Lawrence…you are spot on ! I often think how much LOWER Geico’s insurance rates would be if they did NOT waste millions on dopey gecko ads !! Almost as bad as EVERY offline business that I visit who NEVER bother to ask for email addresses/demographics from the people who have already given them money !! I agree with your blog post 1000%. I’ve written copy for a wide range of clients including a number of different major mailers to date. 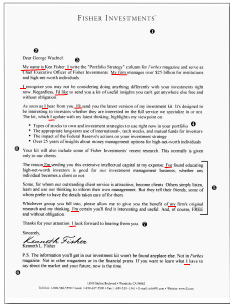 I’ve talked with a number of other high-level copywriters that have written for other mailers and had the same frustrating experience. The consensus is the major mailers have four chronic problems in place that make it really tough to get high-converting copy approved and mailed. Problem #1: They still believe the same themes and concepts that they have been doing since the 1990’s will work now IF you just slap some new copy together for it. As Eugene Schwartz pointed out in Breakthrough Advertising, the same target market of investors (male, conservative, 55+) is at a different level of awareness today and is composed of a completely different group of people than it was in the 1990’s. The last few years have also been a completely different economy as well. Problem #2: Employee, not entrepreneurial mentality. The majority of people working for the major mailers are more worried about keeping their steady paycheck than taking any new, calculated risks that could produce a new winner. So they cling to “what worked 10 years ago is still going to work today” like a drowning rat clings to any piece of driftwood it can find. Problem #3: Refusal to test, even online. If it’s not a home run immediately then they want to scrap the campaign. I’ve personally discovered headlines I wrote that converted 1300% better than my control headline through split-testing so this point really makes me shake my head in disbelief. Problem #4: Complete lack of understanding about direct response marketing, copywriting, or even basic human psychology. A good number of these folks are being appointed as marketing directors because they have a marketing degree, company attrition, or being promoted beyond their area of expertise. One “marketing director” I worked with was not familiar with tactics like Zeigarnik Effect, power of three/triads, or even blind copy bullets. He flagged my salesletter for all three of these concepts. Another one I had to work with… she told me it was illegal to use an exact quote from a celebrity about one of the product’s ingredients (the quote WAS about an ingredient) in the copy. People who don’t know great direct response marketing aren’t going to recognize it even when it lands in front of them on their desks. It pains me to say it because I don’t like seeing people lose their jobs but I’m predicting another 25-30% of the major mailers to close their doors or lay off staff because of these 4 chronic problems that they refuse to address. Anyways, that’s the collective opinion from a number of copywriters here in the trenches. How right you are about Fisher. Never read his letter until I downloaded it. I think he is so Rich that he needs to go on a diet! Loosen that wallet “Fisher” spread the love.